Offense nowhere to be found as Pirates beat Mets at Citi for first time. Who ya gonna call? Bay-Busters! Baseball is pretty big on curses, historically speaking. There was the whole Bambino thing in Boston and plenty of people felt that the Black Sox scandal hung over the heads of the White Sox until they won in 2005. No one is really quite sure which of the many possible curses hangs over the head of the Cubs, but something has guaranteed the team life as a pleasant afternoon diversion with absolutely no chance of actually winning a title. Let's hope the Curse of Jason Bay doesn't wind up haunting the Mets for as long as curses have haunted those other franchises. After a day like Tuesday, it is hard to imagine things turning out any other way, though. The Pirates were able to win at Citi Field for the first time since it opened in 2009 thanks to a late rally off of R.A. Dickey. Dickey was cruising with a shutout into the eighth inning but gave up the tying run on a single to Josh Harrison, who was playing his first major league game. Things went off the rail from there as Terry Collins stuck with his pitcher a bit too long in a tie game and the Pirates scored twice more before Jason Isringhausen was summoned from the pen. 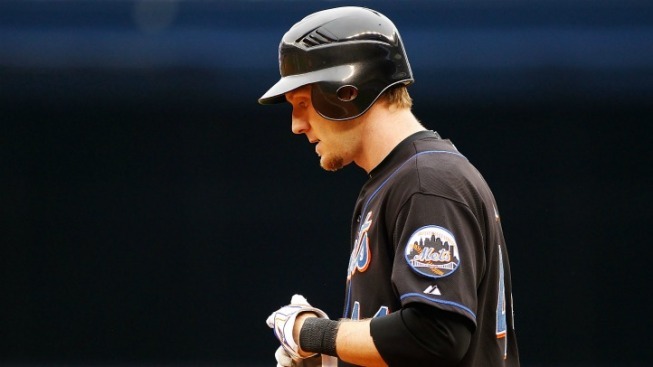 Bobby Parnell gave up some more runs in his return to the big leagues and the Mets lost 5-1. So what does that have to do with Jason Bay? That score in the Mets column didn't just happen by accident. The Mets have now gone 10 straight games without a home run which is pretty shocking even if they are playing without Ike Davis and David Wright. Every game that goes by without a dinger, even one that sees Bay drive in the only run, is another indictment of the decision to sign a player who might not hit 30 home runs over the life of his contract, let alone in one season. Bay is now hitting .242 with a 651 OPS and two home runs on the year, numbers that would normally make you celebrate Tuesday's single to the pitcher's mound because they normally get compiled by players like Rey Ordonez. He was a little better last year -- 749 OPS -- but nothing close to the power hitting player he was with the Pirates and Red Sox. That was hardly what the Mets expected when they gave Bay a four-year, $66 million contract with a vesting option for another year at $17 million. They thought they were getting a bopper for the middle of the lineup, instead they got an object lesson in not overpaying to convince someone to play for you when they really, really don't want to be on the Mets. Said lesson was being taught off the field on Tuesday as well. Adam Rubin of ESPN New York had a report about the Mets possibly changing course and trading David Wright while keeping Jose Reyes through free agency. We've discussed this particular Sophie's Choice in the past, but didn't touch on the elephant in the room forcing them to make it. That's Bay's contract, of course, and, more than Madoff or anything else, that is the reason why the Mets aren't in a position to keep both of their star infielders for the long term. Whatever choice Sandy Alderson makes on that front will be the wrong one because the Mets will be a weaker team for it. That's not his fault, but it feels like we'll be hearing that a lot during the lifetime of the Curse of Jason Bay.